In recent years there has been an explosion in the number of Airsoft gun parts available. ORGA brand products are born from a “wouldn’t it be great if so and so was available” moment during an intense mid-campaign fire fight or late night repair session. This leads to prototypes and testing, and eventual release after we have gotten it just right. 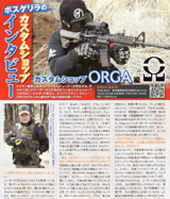 In Japan we have been fortunate to be well received by players, and have had our products tested, featured, and show-cased in a number of issues of ARMS magazine. We look forward to continuing to develop new high grade, quality, ORGA parts. We are now providing our ORGA products internationally. We offer individual sales via our website, as well as wholesale pricing for shops, distributors, teams, etc. Anyone interested in wholesale should contact us via our contact page. It doesn’t matter if you’re an adult or a child, young or old, a man or a woman; the things we want and the things we enjoy become the focus of our energy and passion. As a company we feel privileged to be part of a Airsoft culture that is based on camaraderie, brotherhood, fair play, self discipline, and respect. It’s in this culture that we work to grow and expand our business while we empower players both within Japan and internationally. 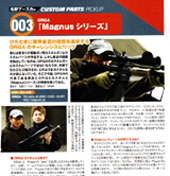 At ORGA Airsoft a majority of our business is repairing and customizing domestic and foreign brand airsoft guns. We see a wide range of models from day to day, and have experience repairing and customizing a countless number of guns. This experience enables us the ability to grow our business into the areas of customer requested mods and ORGA brand product design. As we continue to do our day to day repair and custom work, we are always trying to identify designs that can be improved and lead to future ORGA product opportunities. Sometimes our ideas don’t work, but when we find the ones that do, it sparks a renewed passion to find our next one.